and for general travel in soft, deep snow. know how to get there – and back – safely. winter along the Lower North Shore. Lasting between December and April, the snowy season on the Lower North Shore is one of the most memorable and fun! Here, arrival of the “white gold,” as it’s called locally, means easy access to the most scenic areas of the Lower North Shore. As the majority of communities here are not linked by road, winter and spring allow for extended travel throughout the entire Coast. Along the Lower North Shore, blankets of snow provide an unlimited playground for snowmobiling, skiing, sliding, and ice fishing. 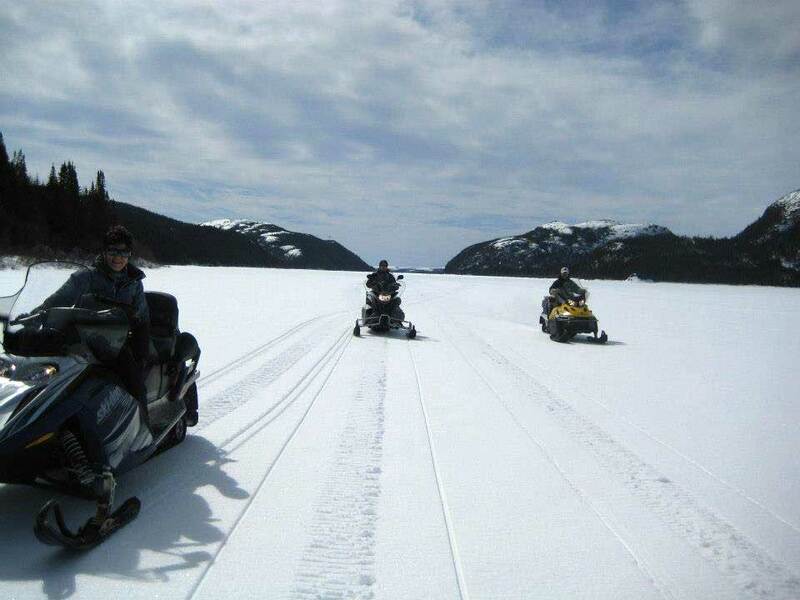 Snowmobiling the Quebec Lower North Shore is an excellent way to explore incredible scenery, indulge in warm hospitality and experience one of the world’s best kept secrets. Hundreds of kilometres of groomed trails and endless open land will make your trip to the Lower North Shore unforgettable. 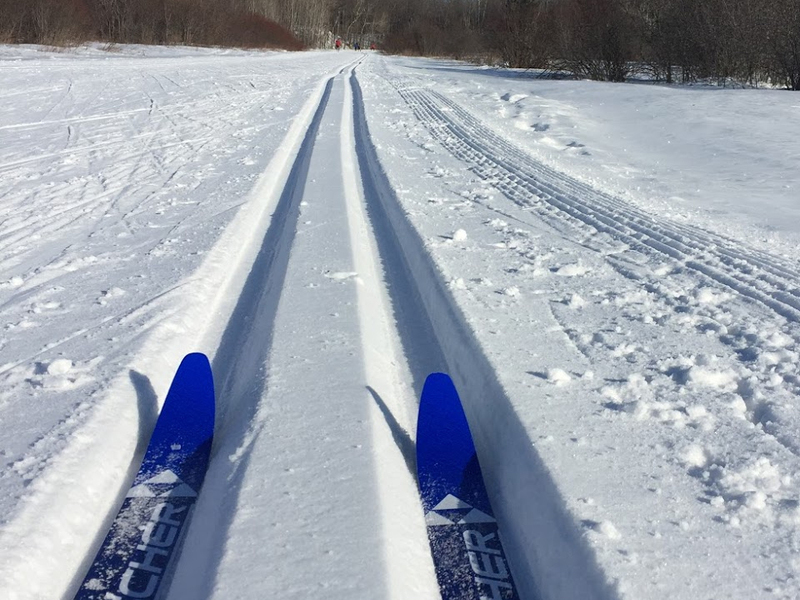 With nearly 536 kilometers of marked and groomed trails on La Route Blanche, linking Kegaska in the western sector with Blanc Sablon to the east. Pick up the Route Blanche from various points in the west (Godbout, Sept-Îles, Havre St. Pierre), or access the region through Labrador in the east. For the experienced snowmobiler, a wide open back-country exists just off the beaten path. You may want to ask a local guide to introduce you to this unforgettable region, where mountains and lakes meet wildlife in abundance. With winter and all of its potential surprises, make sure to come prepared with proper gear, clothing and guidance. As well, be sure to check trail conditions before heading out! Snowmobile rental and guided tours (all-inclusive package). Minimum of 6 people per group. Car rental service is also available. Schedule: year-round Monday to Friday, 8 a.m. to 5 p.m., Saturday, 9 a.m. to 3 p.m. Reservations recommended. Snowmobile, equipment, and clothing rental. An opportunity for a real adventure from Sept-Îles to the Lower North Shore. Traditionally, snow shoes were used extensively across this region by trappers and hunters, and for general travel in soft, deep snow. Today, many residents still use snowshoes or “rackets” for these same purposes. However, more and more, it is becoming a recreational sport and a great form of exercise for those wanting to enjoy the crisp outdoors. While visiting the Lower North Shore, you may want to hike the area using snowshoes, which are sold in many local stores. Keep in mind that winter temperatures can be harsh – so better bundle up on a cold day. Otherwise, spring months offer quite warm temperatures and perhaps even a tan as the sun reflects off the snow. Exploring the great outdoors by snowshoe is part of our culture, part of our winter, and part of our fun! Cross-country skiing is also a great way to take in the scenery of the Coast. For the most part, you can ski anywhere there is snow – which makes for an extensive ski zone! There are also several trails along the Coast that you can follow. A 15 kilometre (9 mile) trail offers a view and experience of the open spaces and boreal forest. The second trail extends for 6 kilometres (4 miles) around the scenic hills of the community. Both trails are loops that start and finish in the village of Tête-à-la-Baleine. The landscape in Chevery is ideal winter activities such as Cross Country Skiing and Snowshoeing with an 8.5 kilometer circuit across the plains, through the boreal forest and over the tranquil frozen Cross River. A second snowshoe circuit offers a leisurely winter hike through Cross River and the Darby Hills west of Chevery for a breathtaking view of the magnificent Gulf Saint Lawrence. Both circuits start and finish in the community of Chevery. One of the most enjoyable spring traditions for families on the Lower North Shore is snowmobiling to a local pond and indulging in some ice-fishing fun. 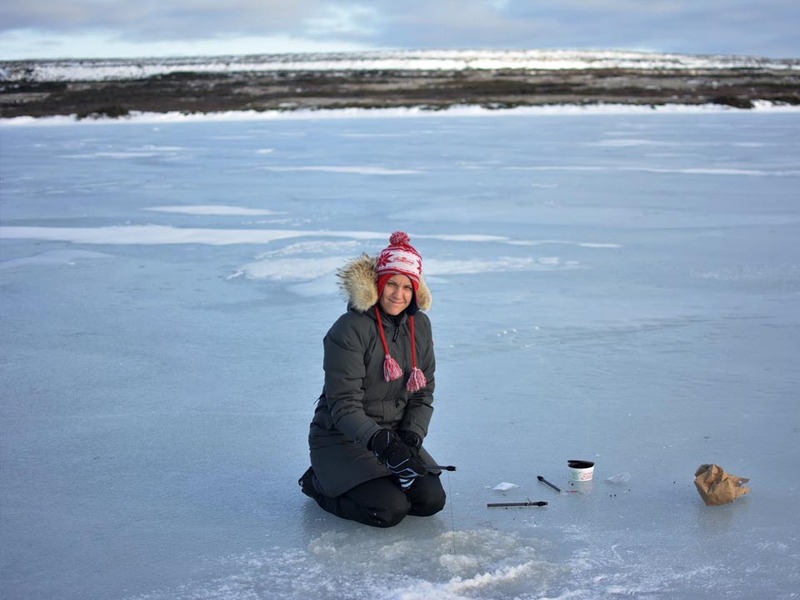 Bait (usually a worm) is lowered on a line through a drilled hole in the ice, where the challenge is to catch the biggest trout, and then haul the line up without losing it. "Boil-ups" are usually part of the outing – where you collect wood to make a small fire, boil the kettle, and have a lunch in the great outdoors! If you are looking to experience this aspect of local culture, be sure to consult with a resident about the ice conditions before setting out. Most ponds and lakes are inland from communities, and you want to make sure you know how to get there – and back – safely. Don’t be surprised if you come across a pond with upwards of 10-15 ice-fishing cabins atop. Many locals come in search of the biggest fish at their favourite fishing spots. Take a moment to stop and chat - you may just find out some tips that will improve your fishing style, and hear some great stories that will add to the experience! There’s a reason why everyone loves winter along the Lower North Shore. 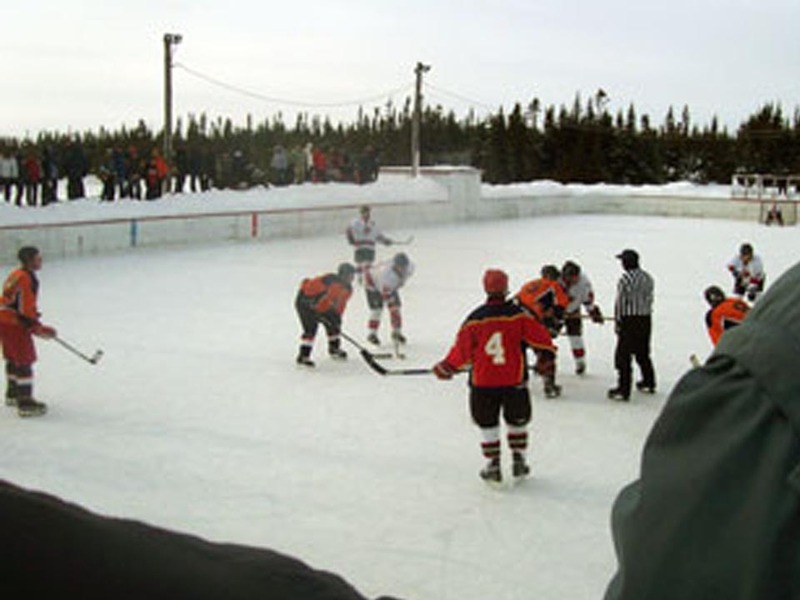 It’s a time when people travel to other communities, host events filled with local cuisine, music and dance, and play their favourite sport: hockey. If you happen to be traveling on the Lower North Shore when a local carnival or hockey tournament is taking place, be sure to take part! Join in as residents celebrate winter, and meet local people who are known for their hospitality.